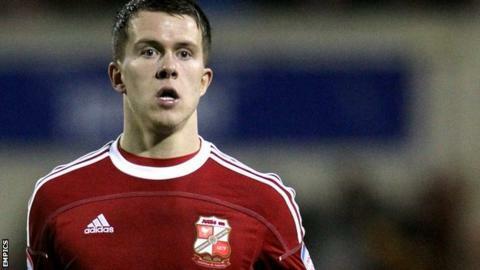 In-form Swindon Town kept their fading play-off hopes alive thanks to Lee Cox's winner against Bradford City. The Robins have now won six in seven but Peterborough's victory over Carlisle means they remain four points behind Posh with just two matches left. Home goalkeeper Wes Foderingham made a superb first-half save to stop a Gary Jones free-kick. Cox grabbed his first Swindon goal when he calmly shot right-footed into the bottom corner after 64 minutes. Mark Cooper's men really should have taken the lead just before the hour but Michael Smith's goal-bound shot from a Miles Storey cross was kept out by Jon McLaughlan. The hosts were the better side after Cox's goal and Alex Pritchard had the chance to seal the win, only to drag an effort just wide. "I thought we totally dominated the game from start to finish. "We just had to wait for that opportunity to come along. I was pleased with the maturity that we showed to control the game, sometimes it can be frustrating. "We continued to play and moved Bradford across the pitch and waited for the gap to appear. "Whatever happens this year we've finished the season in great fashion with two to play." Match ends, Swindon Town 1, Bradford City 0. Second Half ends, Swindon Town 1, Bradford City 0. Garry Thompson (Bradford City) wins a free kick on the left wing. Attempt saved. Michael Smith (Swindon Town) right footed shot from outside the box is saved in the centre of the goal. Foul by Miles Storey (Swindon Town). Adam Reach (Bradford City) wins a free kick on the right wing. Corner, Swindon Town. Conceded by Jon McLaughlan. Michael Smith (Swindon Town) wins a free kick in the defensive half. Attempt missed. Alex Pritchard (Swindon Town) right footed shot from the centre of the box is close, but misses to the right. Substitution, Bradford City. Aaron McLean replaces Raffaele De Vita. Attempt saved. Miles Storey (Swindon Town) right footed shot from the right side of the box is saved in the top right corner. Goal! Swindon Town 1, Bradford City 0. Lee Cox (Swindon Town) right footed shot from the centre of the box to the bottom right corner. Attempt missed. Adam Reach (Bradford City) left footed shot from outside the box misses to the right. Corner, Swindon Town. Conceded by Gary Jones. Attempt saved. Michael Smith (Swindon Town) header from very close range is saved in the bottom right corner.